Capella Tower (formerly 225 South Sixth) is a skyscraper in Minneapolis, Minnesota, USA. The building opened in 1992 with the First Bank Place being the headquarters for First Bank System. In 1997, First Bank System acquired US Bancorp and changed the name of the building to US Bancorp Place. 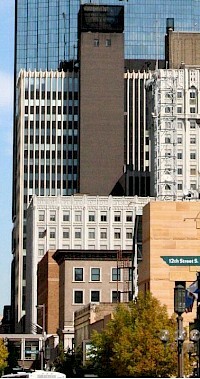 The headquarters of US Bancorp moved into the US Bancorp Center in 2000, whereupon the tower changed to 225 South 6th Street In March 2009, the building took its present name. The Foshay Tower, now the W Minneapolis - The Foshay hotel, is a skyscraper in Minneapolis, Minnesota. Modeled after the Washington Monument, the building was completed in 1929 in the months before the stock market crash in October of that year. It has 32 floors and stands 447 feet (136 m) high, plus an antenna mast that extends the total height of the structure to 607 feet (185m). 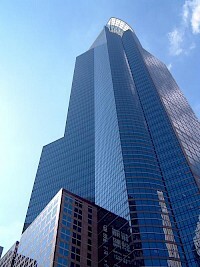 The IDS Center (80 S 8th St) is the tallest building in the state of Minnesota at 792 feet (241.4 m). Opened in 1974 as the IDS Centre, it stood 775 feet 6 inches (236.4 m), though a 16-foot (4.9 m) garage for window washing equipment was added at a later date. 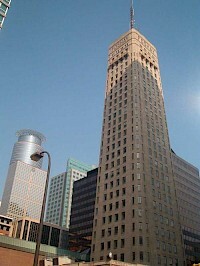 In 1992, the 776-foot (236.5 m) tall First Bank Place, now known as the Capella Tower, was completed nearby. Midwest Plaza is a 320-foot (98 m) tall skyscraper in Minneapolis, Minnesota. It was completed in 1969, and has 20 floors. 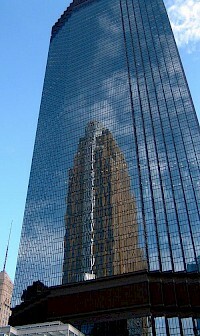 It is the 30th-tallest building in the city and is located on Nicollet Mall. 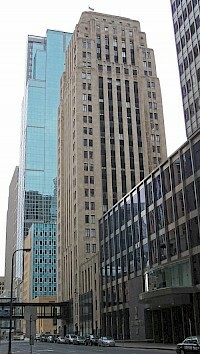 At the time of its completion, the building stood as the fifth-tallest structure in Minneapolis, and the city's second-tallest post-World War II high-rise, behind One Financial Plaza. A skyway connects the building to The Metro Apartments, the Medical Arts Building, and the IDS Center. 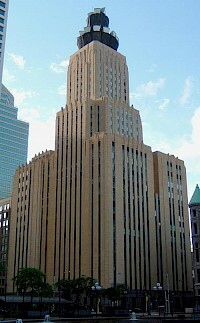 The Qwest Building in Minneapolis, Minnesota was completed in 1932 and became the tallest building to be built in the city during the 1930s, 1940s, and 1950s. Named for its current owner, it was previously known as the Northwestern Bell Building. Originally standing 346 feet (105 m) tall, the structure grew to 416 feet (127 m) with the addition of a microwave antenna "crown" in 1958. Rand Tower is a 26-story skyscraper in Minneapolis, Minnesota, USA that was one of the city's tallest structures when it was completed in 1929. It was designed by Holabird & Root for Rufus R. Rand, Jr., a World War I aviator who was part of the family that owned the Minneapolis Gas Company (Minnegasco), now part of CenterPoint Energy. Rand had flown in the Lafayette Flying Corps during the war. 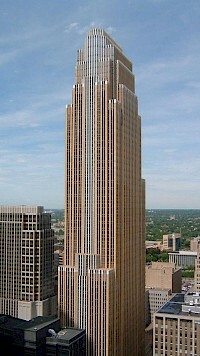 The Wells Fargo Center, formerly known as Norwest Center, is the third-tallest building in Minneapolis, Minnesota, after the IDS Center and the Capella Tower. Completed in 1988, it is 774 feet (235.6 m) tall. For many years, this was believed to be one foot shorter than Capella, but that structure actually had a different height (see the IDS Center article for details).